Business Week 2018/2019 Executive Team: Nick Dall, vice president (left); Bryce Pietrowiak, president; Carrie Happel, vice president of marketing; and Emily Clinton, vice president of logistics. Business Week has been a cornerstone of the College of Business’ calendar of events for the past 40 years. As former Senior Director of Development Norris Porter observed, it is unusual to see a restaurant or store—much less an event—that has been around since 1979. “For an event of any kind to go on that long, it makes it pretty special,” he said before applauding the faculty, staff, and students who created the quality professional development and networking opportunity. 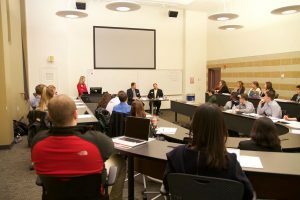 The 2019 Business Week, which will be held February 11–14, offers engaging, authentic, and professional opportunities that enable students to interact closely with alumni, employers, and industry thought leaders as they develop essential soft skills and understandings required for success. Not only do Redbirds have the opportunity to attend a range of engaging programs over the course of the week, but the students themselves have consistently played a pivotal role in the planning process for the event. Indeed, from its earliest days, student involvement has remained a foundational part of Business Week. 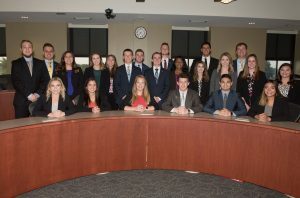 Porter explained that in the early days of the program each registered student organization had a member on the planning committee and individual students were responsible for finding a guest speaker to visit a specific class. “As I recall, almost everything happened within a classroom, other than the keynote speaker,” he said. Today, Business Week activities take place in a wide range of settings from sweeping auditoriums to classrooms to putting greens on a golf course, and they can be as largescale as a keynote speaker addressing hundreds of future business leaders at once or as small and personal as a one on one conversation between student mentors and mentees. The idea of students helping students was a driving force in the development of the Business Week Mentor Program, which since 2011 has grown from a start of about 20 students to over 120 mentors in 2019. Nappi also emphasized the importance of bringing industry leaders to campus as part of the Business Week activities. Over the years, guest speakers have included successful men and women from a wide range of businesses. “It’s a great opportunity to engage with someone who’s been very successful,” said Porter. He encouraged students to participate in the 2019 slate of Business Week activities. Transition Seminars provide networking opportunities for students to learn from successful alumni. Additionally, he saw the event open doors for companies to support faculty research, establish scholarships, and become more familiar with the programs and resources available at Illinois State. “My whole philosophy was you build relationships with companies and corporations and that relationship is going to materialize and bring benefits not only to the college but to the entire university,” Nappi said. For more information about this year’s Business Week please go to Business.illinoisstate.edu/BusinessWeek or email BusinessWeek@IllinoisState.edu.